DB 101 112 was presented in a classic 'Rheingold' livery on 27.03.2017; The ivory, silver and dark blue colors are a tribute to this classic Rheingold design from 1962. It is not the first time this colorscheme is re-used in modern time. In 2014 museum locomotive E03 001 was repainted in the same Rheingold color scheme. 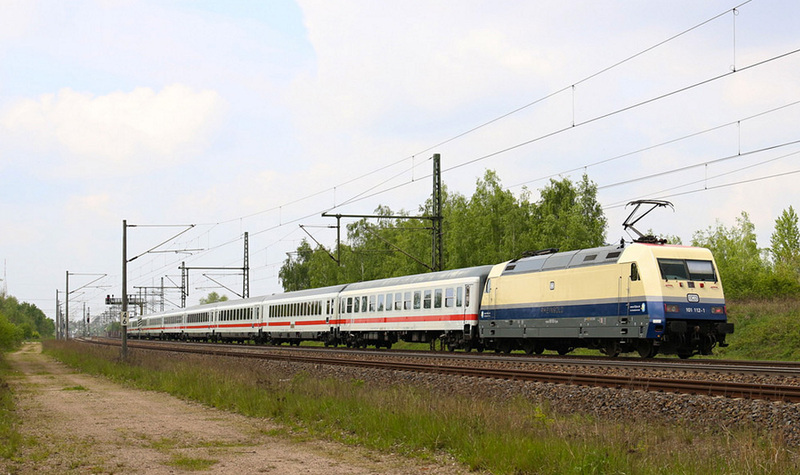 The 101 112 can now be seen across Germany pulling DB's intercity trains. But of course, we can not wait until the locomotive makes its debut hauling matching passenger coaches..
A group of model railway traders from Germany have put money together to wrap a DB 101 series locomotive in an old-skool Rheingold livery. And this is the result! Tip: Next tuesday, 02.05.2017, DB locomotive 101 112 will start its maiden run in this livery. Seen today at Leipzig: DB Fernverkehr 101 023 in the same livery as 101 004, a commercial livery for insurance company Bahn BKK. Thank you Oliver Wadewitz. DB's newest Werbelok: 101 055 promotes Schauinsland Reisen with CNL447/457 last night in Cologne. (Martin Morkowsky). "Mini Cooper. Is it love?" Ten locomotives promoted the Mini Cooper car in 2002-2003. "Die Marche, ganz Italien in einer Region. Ihr heiterer Urlaub"
Five locomotives, DB 101 016, 056, 096, 109 and 117, promoted 'Die Marche' in 2002-2005. All machines had two different sides, resulting in ten different designs.